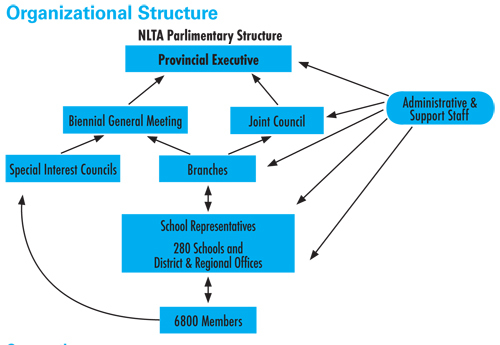 The organizational structure of the NLTA is illustrated by the following diagram. The Biennial General Meeting (Convention) of teacher delegates is the main governing body of the NLTA. The members of the Provincial Executive Council are elected by the delegates to Convention; policy and by-laws of the Association are determined by that body. The Constitution and By-laws place full and complete authority for the direction of the Association between Conventions with the Provincial Executive Council. The Council is elected biennially and consists of a President, Vice-President, and 10 members. The President and Vice-President are elected by province-wide vote. The 10 members are elected at the Biennial General Meeting. The immediate past-president, by virtue of the position, may be an Executive member for the year immediately following his/her term of office. The Executive Council meets on a regular basis to transact the business of the Association and to consider recommendations from the Executive and ad hoc committees. The Executive operates through a series of standing and ad hoc committees appointed by Provincial Executive. Teachers from across the province serve as members of these committees generally centralized in one particular area of the province. The following committees are responsible to the Executive unless there is specific direction to the contrary from the Biennial Convention. The Joint Council is comprised of Branch Presidents and Provincial Executive. It began as a liaison/discussion group and has now evolved into a decision-making body that assists in directing the work of the Association between Conventions. Governance of the Association, in reality, has become a shared responsibility between the Biennial Convention, Joint Council, and Provincial Executive. An effective and efficient Branch structure is essential to the success of the Association. Branches elect their own officers and executive, manage their own affairs and set their own rules and by-laws subject to the by-laws of the Association. There are presently 49 Branches of the NLTA. See the link below for a complete list of Branch Presidents and the branches or you may contact the NLTA office to receive that information.